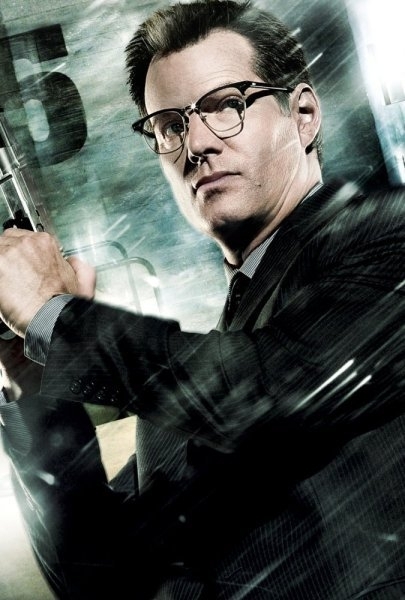 Heroes‘ Noah Bennet (a.k.a. Horn-Rimmed Glasses or H.R.G.) seemed to have it all – a comfortable home, a loving wife and children, and a steady job with Primatech Paper Co. Most people, however, had no idea he was living a double life and that Noah’s actual work involved tracking down and imprisoning evolved humans for a mysterious organization known as The Company. His daughter, and an evolved human, Claire, eventually finds out her father’s secret, and in the show’s third year, Noah’s wife Sandra and son Lyle discover that he is now doing the same type of work for the U.S. government. 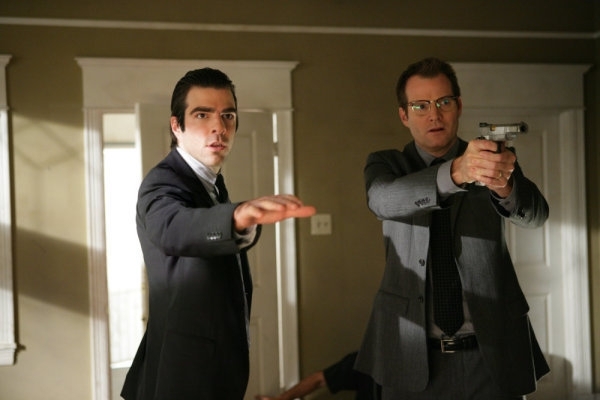 Sandra decides to leave Noah, who, at the end of the season, helps “kill” one of the most dangerous evolved humans ever, Sylar, or so he thinks. In the season four opener Orientation, he is asked to once again help get rid of Sylar, who is, in fact, still alive, but Noah refuses. Meanwhile, his own life is in danger from Tracy Strauss, who uses her ability to control and freeze water to try to drown him in his car. 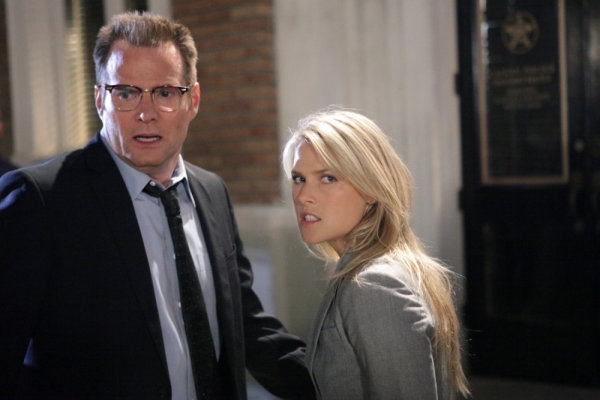 That scene turned out to be quite a memorable start to the season for actor Jack Coleman, who plays Noah. “I thought, “Is H.R.G. going to live? It’s going to be interesting to see what happens.’ They [the show’s producers] had already told me that this scene was coming, and the actual shooting of it was a lot of fun as well as challenging and one of those things you get to do on a show like Heroes that’s just really cool. They had these big hoses coming into the car vents, and literally on the cue of my turning on the ignition, the water gushed into the car. It came in with such force that it knocked my glasses off, and in 10 or 15 seconds the car interior was filled with water. Almost being drowned is just a small part of Noah’s life being turned upside-down at the start of Heroes‘ fourth year. Now living alone, his wife divorcing hm and his daughter Claire (Hayden Panettiere) trying to start a new life for herself at college, this onetime “company man” has reached a personal as well as professional crossroads. Noah begins to reevaluate what is and what is no longer important to him, including his involvement with evolved humans. This was a side of his character that Coleman enjoyed having the chance to explore. “I liked the idea of redemption and H.R.G. taking stock of his life and deciding that all the time he’s been bagging and tagging [evolved humans], he hasn’t really helped others very much,” says the actor. “I was curious to see where that would go and I think it’s kind of cool that by the end of the season he does get to help other people without shooting them or in any way harming them. “As for Noah’s and Sandra’s divorce, again, I’d heard that that would be happening, and I was surprised that it was essentially a fait accompli when the season starts. I thought it was going to unravel as we went along, but basically it had unraveled and the writers had done that pretty well last year where Sandra could no longer trust Noah. You get to a point where you stop giving someone another chance, and she had reached that point with Noah, and understandably so. “I always liked the family unit and I loved working with Ashley Crow [Sandra Bennet]. I think it made a certain amount of sense just in terms of mixing things up from season to season and focusing on a guy like Noah, who thought he was doing all this for his family and to protect them. When, however, you take that family away, you get to see who he really is and the soul-searching that my character has to do. I think that’s what’s been different this year for me. Despite Tracy’s (Ali Larter) efforts to drown him, Noah is saved by Danko (Zeljko Ivanek), a former senior government agent who he worked with when hunting evolved humans. Noah and Tracy later meet, and she tells him that he is one of the former “Company” employees who she has vowed to kill. He then does something, though, that changes her mind about him, so much so that the two join forces to save another evolved human named Jeremy Greer (Mark L. Young) in the season four episode Strange Attractors. “I liked that early on there was a very wary but slowly building friendship between Tracy and Noah,” says Coleman. “Obviously she was very suspicious of my character, and because she had the ability to kill him at any time, he was wary of her as well. In Orientation, Noah saves Tracy from Danko with some help from Jimmy Jean-Louis’ character of The Haitian, who erases Danko’s memory of Tracy so that he is no longer chasing after her. In the Heroes‘ fourth season episode Ink, Noah is surprised to find that Claire’s college roommate Gretchen (Madeline Zima) knows about her regenerative powers. When he suggests that The Haitian erase Gretchen’s memory of this, she refuses, telling Noah that she will handle it. 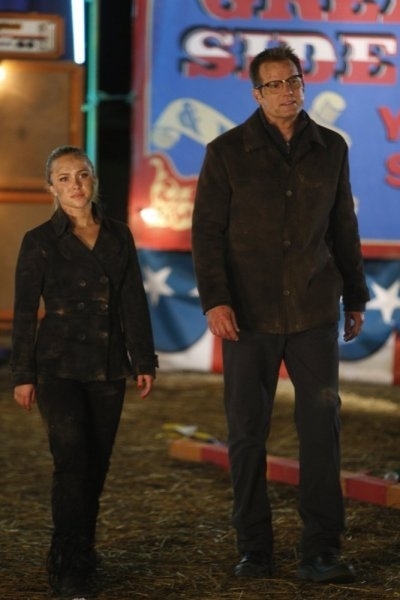 Claire longs to lead a normal life out in the open, so much so that she considers an offer by Samuel Sullivan (Robert Knepper), the leader of a travelling carnival, to join his group of evolved humans. Unbeknownst to Claire, he has an ulterior motive, but Noah is looking out for his daughter and resolves to bring Samuel down. “It was interesting to watch the way that Samuel woos Claire to come join his carnival and find a new family and be able to live openly,” notes Coleman. “That was all very appealing to her, but then you realize that he’s not telling the whole truth. Samuel comes out and says, ‘It’s not really Claire that I’m after,’ and I think that’s when he’d made up his mind to make my character the fall guy in the grand plan that he has. “Noah already has this reputation of hunting ‘specials’ [evolved humans], so in the episode The Art of Deception, Samuel sends Eli [Todd Stashwick] up into the hills above the carnival and has him shooting at his own kind, which he blames on my character. As a result, all of Samuel’s people coalesce around him, and it suddenly becomes apparent that this was his intention all along – to lure H.R.G. to the carnival and set him up as his straw man in order to rally the troops all around him. Claire discovers a great deal about her father’s past, including his reason for agreeing to work for The Company, in the penultimate season four episode The Wall. This story also has Peter Petrelli (Milo Ventimiglia) and Sylar (Zachary Quinto) trapped in a telepathic world of Matt Parkman’s (Greg Grunberg) making. “Allan Arkush directed The Wall, and he was a director as well as executive producer on Heroes for the first three seasons,” says Coleman. “He directed [season one’s] Company Man, among other episodes, and Allan came back to direct this one. So it was a pleasure to work with him again, and I got to do all the flashback scenes where I was a little nervous about looking like David Hasselhoff in Knight Rider,” jokes the actor, “but those scenes ended up being both appropriate and looking good. “Flashback scenes like that are always challenging because you’re supposed to look 28 years old again, and that isn’t always easy. We shot everything in black and white and I got to work with Eric Roberts [Thompson], which I thoroughly enjoyed. Then we had all the scenes in the House of Mirrors where Damian [Harry Perry] shows Claire all these bits of Noah’s past. This is Samuel’s last ditch effort to bring her over to his side, which, of course, fails. Towards the end of The Wall, Samuel traps Noah and Claire in a trailer and uses his ability to manipulate geological materials to sink it deep below the Earth. Although Claire’s lungs will regenerate over and over, Noah will eventually suffocate and die. Lucky for them, Tracy comes to their rescue in Heroes‘ fourth season finale Brave New World. When Heroes debuted, H.R.G. 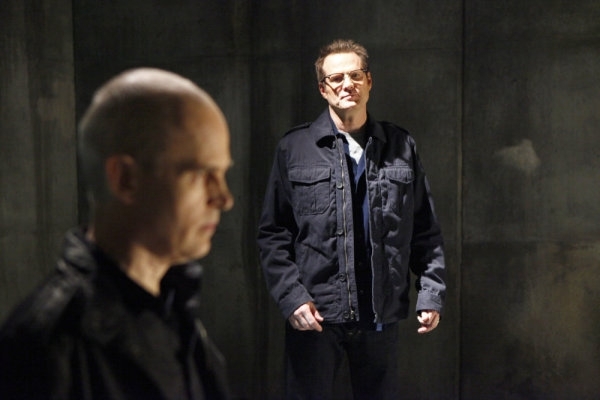 appeared on the surface to be one of the bad guys, and while the show’s writers as well as Coleman could have easily focused on that, they instead chose to dig deeper. “One of the true joys of playing this character is that he is multifaceted, and there’s been a lot of development with him,” says the actor. “Noah was a true believer when we first met him. He was a company man and sold on The Company’s mission and what he was doing. He could justify anything and took a great deal of pleasure in his sometimes dirty work. “As time went on, my character began to question The Company and what it was up to and what it was going to do. 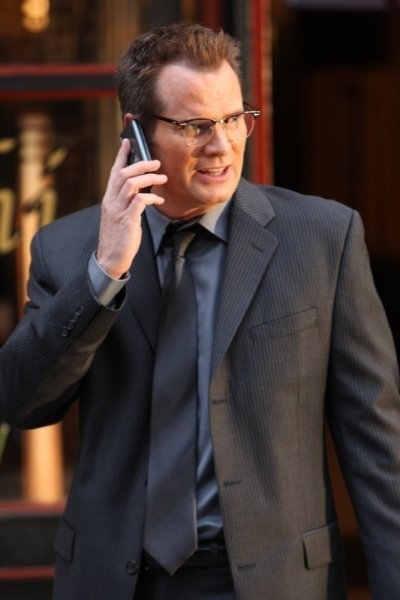 Then, however, by the first season episode Company Man, you see it all really pivot. You suddenly know for sure that Noah has actually been trying to hide and protect his daughter rather than harvesting her or whatever other theories people out there had, because no one was quite sure what his intentions were. At that point, though, I think you realize without a doubt that Bennet really does love his daughter as well as his family and is trying to keep them safe. “Then he goes on the mission to try to bring The Company down, and that leads into the second season and all that betrayal at the hands of Suresh [Sendhil Ramamurthy],” continues Coleman. “So Noah goes from true believer in The Company’s work, to trying to bring it down, and then just doing his best to keep a low profile and out of sight. In season three, he’s essentially forced into doing all this work for The Company to keep it off his family’s back. They try teaming Noah up with Sylar and do all these other kind of crazy things that bring him back to his old hunting days, but he’s doing it under duress in order to keep his family safe. So you see him kind of careening back and forth between family man to secret agent to man without a country where he’s on the lam and he can’t trust anyone. There has been no official word yet if Heroes will return for a fifth season this fall, but if all goes well and it is renewed, what are Coleman’s hopes not only for his character but also the series as a whole? “That’s a good question, and a tough one,” he says. “I’m not entirely sure that I could tell you where I’d like Noah to go and where I want the series to go. I don’t have a pat answer and would have to think long and hard about that. Heroes is just the latest entry in Coleman’s long and varied list of acting credits. Longtime fans will remember him as Steven Carrington in the hit ABC nighttime soap Dynasty. Other work includes roles in such series as Nip/Tuck, CSI: Miami, Without a Trace and Entourage as well as a number of made-for-TV movies and feature films. The actor has managed to maintain an ongoing presence in front of audiences over the years, which is not as easy at it sounds. “This industry is tough and it’s getting tougher, and as you get older it gets a million times tougher,” explains Coleman. “The availability of jobs and the outlook for continued employment is far greater if you are in your twenties or thirties then it is when you’re in your fifties. So the fact that Heroes and such a great character like Noah came along at a time in my career where I could have easily just gone out to pasture is incredibly rewarding. It’s also been a show that I’ve really enjoyed doing and with people who I enjoy working with. As noted above, photos by Adam Taylor, Trae Patton, Justin Lubin or Chris Haston and copyright of NBC, so please no unauthorized copying or duplicating of any kind. Thanks!